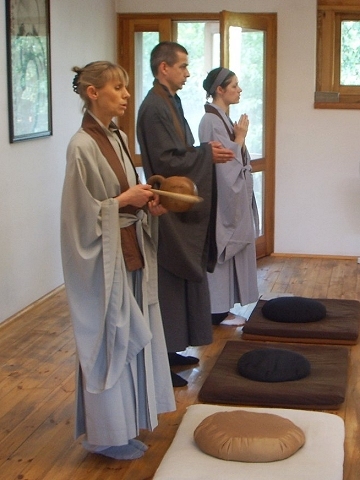 In the Kwan Um School we make use of four forms of Zen practice. 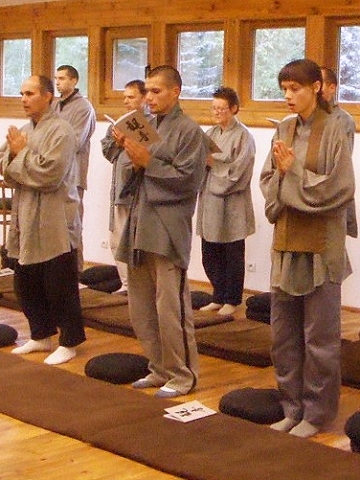 All these forms of practice are also taught and shared outside Zen centers in prisons, universities, hospitals and inter-faith services in the community. This takes place morning and evening, usually for half an hour. 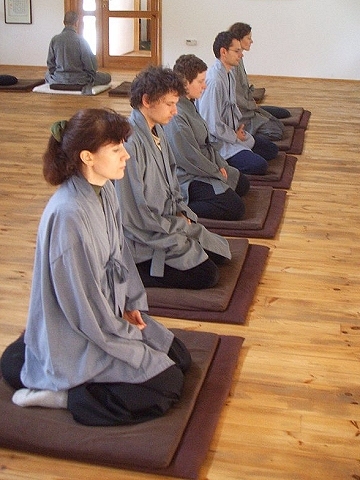 During retreats, half-hour sessions of sitting meditation are separated by short ten-minute breaks of walking meditation. 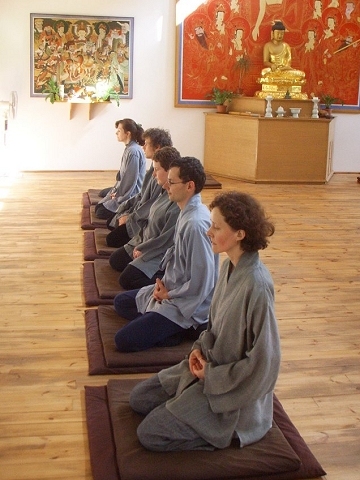 For sitting, the classic Buddhist posture is taught: legs crossed, back straight, eyes half closed, hands in mudra, mind aware of breathing. 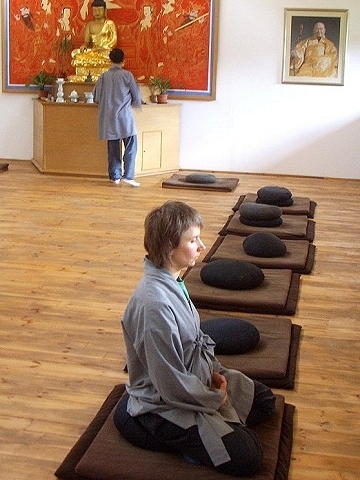 In the Kwan Um School of Zen, meditation is not primarily dependent on the attitude of the body, but that of the mind. 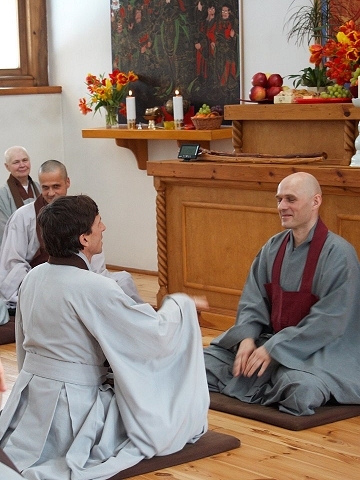 During sitting meditation the practitioner continually asks a great question such as ‘What am I?’ Faced with the power of this question, thinking stops and Don’t-Know appears. Don’t-Know is the name of the mind before thinking. We can call it the mind, Buddha, original nature, the absolute, holiness, energy or consciousness, but originally this point has neither name nor form. Cutting off all thoughts and returning to the Don’t-Know mind allows the Zen practitioner to go back to their original being. 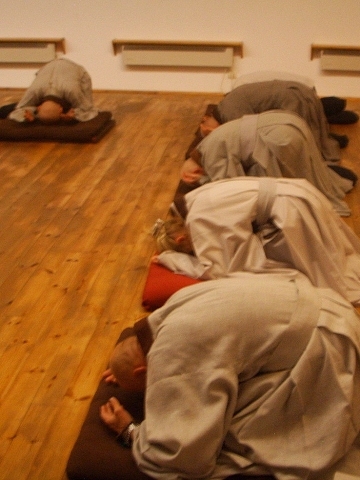 For Zen students, the day begins with 108 prostrations (bows). In the Korean tradition, there are 108 Buddhas and Bodhisattvas. Another explanation is that human beings have 108 kinds of delusions and we bow in order to cut them off. 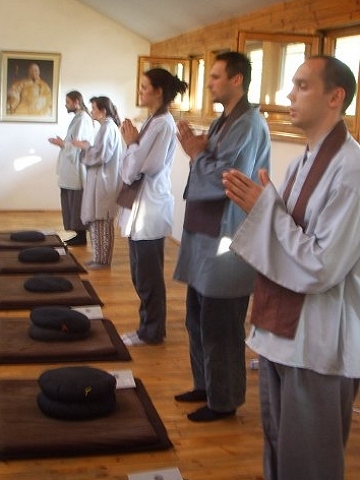 We are not bowing to Buddha, but to ourselves. Our small ‘I’ (ego) bows to our big ‘I’ (unity of self and all) until it disappears. 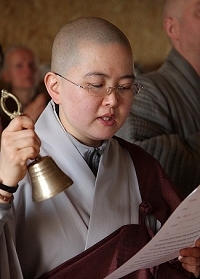 There are three types of chants: prayers for the benefit of all beings, sutras, and mantras. The words, except for the mantras, are transliterations of Chinese words in Korean. During chanting, each sound has its own meaning which can penetrate the consciousness; this is why the chants are sung like mantras, for the power of the sounds. In parallel, teaching explains the meaning of the words, so that the sense will echo in the mind and help us deepen our practice. These are questions / answers with the Master. 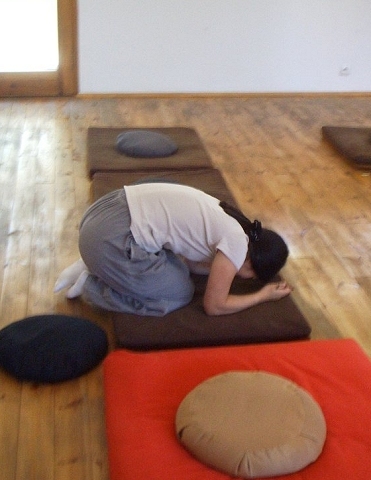 During retreats the teacher poses some kongans to each student. ‘What am I?’ is considered to be the original kongan.